When she came back from W.Va., She was 47 and this was 1904. She took their earnings from the Hopewell farm and moved back to the 40 + 75 acres; got $1200 for whole thing. She and Uncle Charlie (Fickeisen) had assumed the ownership of the old homestead, the rest of the children signed wavers. Eva and Clara lived on the old home place until they came to town when Clara was 19 (1909) and got jobs. Clara worked at the Cigar factory. Eva worked for Pape's grocery store on Greene St. and was a combination housemade, nanny and store clerk. Grandmother was 14, Ella was 22. Here is a wonderful picture of several of my relatives during the described time period. 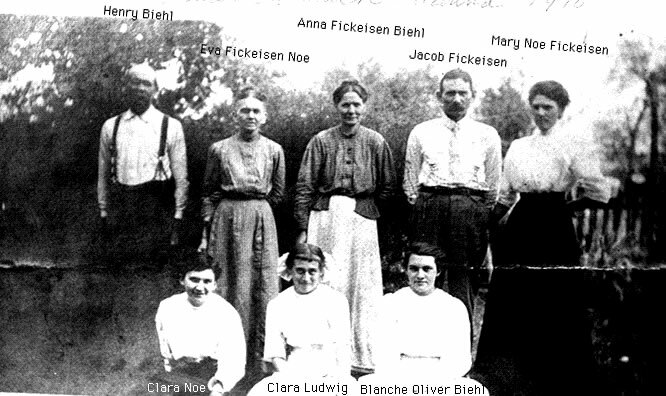 Back row: Henry (Heinrich) Biehl, my great grandmother, Eva Fickeisen Noe, her sister, Anna Fickeisen Biehl (wife of Henry), Jacob Fickeisen and his wife, Mary Noe Fickeisen. Front row: my maternal grandmother, Clara Noe, and her friends. Blanche Oliver Biehl married Anna's son, Irving. Eva let Charlie pay the taxes on the homestead property after the oil royalty ran out. Charlie charged her for things he hadn't done. Charlie came along with a deal that Doc Johnson would buy the place for a retirement retreat. Eva deeded him the 75 acres. But she kept the 40 acres. Mom says Uncle Charlie was a crook. He told Eva that she still owed him and Maggie a couple of hundred. He put his and Maggie's name on the deed to the 40 acres. Eva couldn't read and finally when her granddaughter, Lorene, started to work for N.E. Kidd's law office, she figured out that Eva had signed this deed admitting the other owners. The Washington County Recorder of Deeds Office records show that on June 25, 1934 such an event as described above did occur. Apparently, however, the property of Abraham Fickeisen was owned jointly by Eva Noe, Charles E. and Rosena Fickeisen, and all the hiers of Margaret Becker: J.K. Becker, widower, J.E. Becker, Elmer Becker, Oma Becker, and Wanda and Clifton Hill, husband and wife. It was sold for "$1 and other valuable considerations." 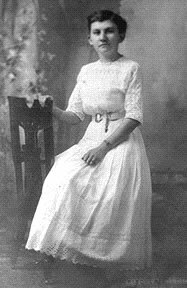 Clara Sullivan witnessed for Eva Noe. Other witnesses were F. Scott Shiltz (for J.E. and J.K. Becker), Laura Becker, and Ernest E. Erb. In 1925, the 40 acres went to joint ownership by Harmon Fickeisen, who was the son of Charlie Fickeisen, Wanda Hill, who was related through grandma's sister, Margaret Fickeisen Becker, and Eva Noe, my great grandmother. Charlie's son Harmon and Wanda, a granddaughter of Kate, never would pay the taxes. Lorene (my mother) paid the taxes for 20 years. Lorene and her husband, Fernand, decided to sell the property. She sold the coal rights for $12000, a strip 3 feet wide and 9 feet deep full length of 40 acres. She sold the whole property for $12000. This was split three ways with Harmon and Wanda ($8000) They never said thank you. She could have showed that she paid the taxes, but didn't. She said, "I'm not going to be greedy. There's been so much thieving and cheating since 1872, that I'm going to put an end to it right now." She felt that she had the sanction of the lord to do it. "The only one who came and thank me was Clifton Hill (Wanda's husband), and he was only an inlaw. He stepped back and said 'that was awful nice of you to do that for us, we needed the money.'" Lorene said "That's alright." Clifton said, "You know you could have just took the money." She said, "I know." Then he shook her hand. Doc Johnson had bought the original 75 acres in 1934 and built a house on it. Jeff Smith, the son of my sister, Vicki Andris Smith, recently bought 10 acres of land which is less than a mile away from the original homestead, and lives there with his wife, Gee. About 1953, the 40 acres passed out of our immediate family.